Well, I'm feeling the hurt of lack of creativity, but I'm trying and learning new things nonetheless. March 5: Last Wednesday, I saw an interesting snippet in the local newspaper, but it didn't occur to me that it was something new. The next day, I pulled that snippet out of a newspaper and got it drilled in my mind. According to The Aylmer Express, "Daylight Savings Time was originally instituted during the First Great War as a way to save energy in Europe, U.S.A. and Canada. It was cancelled at the end of the war but reinstituted during the Second Great War." I did not know that. I know that I don't mind falling back, but springing forward is a little more difficult to adjust to. March 6: Although I'm not really into a whole lot of beauty stuff, what do I do on a day I feel under the weather? Pamper myself, of course! So I attempted the facial mask. I had researched some different recipes, many of which seemed pretty straightforward. I found some interesting ones, like the one that used ground coffee and cocoa, but I couldn't justify wasting a 1/4 cup of expensive Hershey's cocoa on my face. Another one that intrigued me was one for acne-prone/acne-scarred skin, which called for a pureed onion. But then it occurred to me that putting pureed onion on my face could become an emotional ordeal. In the end, I settled for grinding up some oatmeal in my Bullet, adding some honey and water. It smelled good. And I confess, I ate some before putting it on my face. The facial is supposed to tighten your skin, and my skin definitely felt tight with oatmeal drying on it! I won't post pictures of that, because I don't look so good with breakfast on my face. But while I was waiting for 15-20 minutes, I sang this simple song, which has been on my mind a lot lately, and seemed fitting for the occasion. "I have so many masks to cover up and hide." Washing all the oatmeal off was a bit tedious, and I found myself thinking "I don't think I'm going to do it this again." But afterwards when I saw and felt how nice my face was, I wasn't so sure anymore. Who knows? 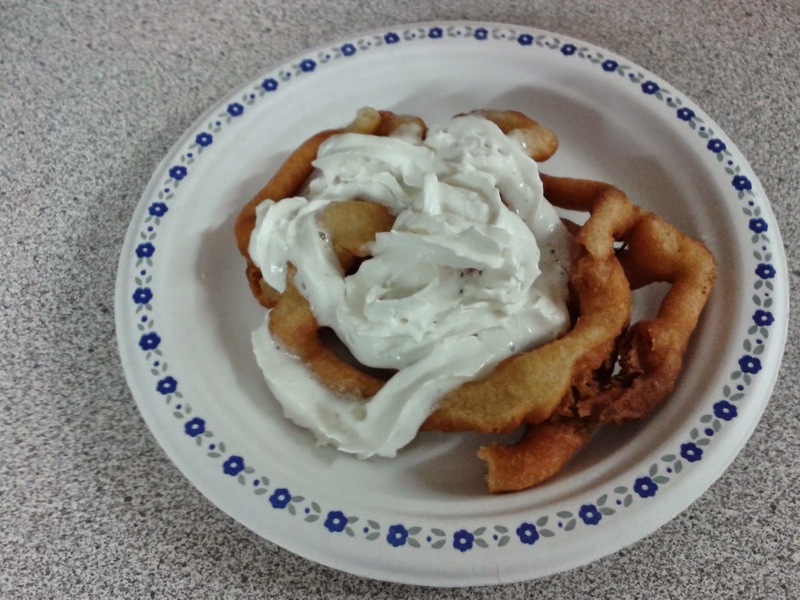 March 7: After my shift at work Saturday, I fried myself a funnel cake. I had never had a funnel cake before, and although we unfortunately didn't have ice cream or berry sauce or any other kind of yummyness to put on it, we did have whipped cream. Oodles of sweet, fatty goodness! March 8: On Sunday, I saw a video about how to use a seam sipper in a way I didn't know. Not that I sew. In truth, the thought of sewing terrifies me. I would do just about any household chore before trying to sew. But if I do try, the seam ripper has to be handy. Then I also read an article from which I learned some new things, although it also left me somewhat disturbed and disgusted. In 1951, doctors could take tissue samples from patients and use them for research without the patient's permission. And so, one woman's cells were mass reproduced and sold for research and other medical and scientific discoveries. I had very mixed feelings about the situation, especially when something is taken from a person and turned into a multibillion-dollar industry without their knowledge. March 9: In my swim class, I tried learning the whip kick. By this I mean there was a whole lot of kicking going on, but I wasn't going much of anywhere. I can almost guarantee people that if they were in a pool with me during one of my lessons, the two phrases they would hear out of my mouth most often would be "I hate this!" and "I can't do this!" Thankfully, I'm not ready to give up. I enjoy it, even when I'm frustrated, can't figure something out, or just don't have the strength and endurance. I do sometimes wonder what people think of me when they see my talking to myself, trying to talk myself through what I'm supposed to do, or should have done before sinking below the surface again. However, I did have a great conversation with the lifeguard afterward, just encouraging each other in our faith, and swimming has been one thing I'm so glad I'm learning. March 10: Since I would like to learn how to knit and crochet, an article about the history of knitting caught my attention on Knowledge Nuts. It turns out, men used to knit professionally while women weren't allowed. There were guilds that men could get into but it was about as difficult to become a professional knitter as becoming a blacksmith. Only in the Victorian Era did knitting become a hobby dominated by women. March 11: On Wednesday morning, I was reading in the book of Acts, and in Acts 22, the word "tribune" caught my attention. It occurred to me I didn't know what a tribune was. I held that thought and kept reading, becoming aware of the number of times the words "tribune" or "tribunal" came up. Then I headed to my computer for some research, and I learned more than I initially anticipated. b. any of the six officers of a legion who rotated in commanding the legion during the year." Between the dictionary and Wikipedia, I learned a number of things. Plebeians were the common body of free Roman citizens, while patricians were the ruling class of ancient Rome. A tribunal was a raised platform where officials would take their seats. Going back to the text with this knowledge, a lot more made sense now. When the centurion was going to flog Paul in Acts 22:22-30, he called the tribune. It was the tribune's job to intervene on Paul's behalf, a common Roman citizen. This also explains why, when Paul's nephew comes to Paul in the barracks to tell him about the ambush planned against him in Acts 23, Paul asks the centurion to take his nephew to the tribune to speak to him. This tribune was Claudius Lysias. Lysias actually comes on the scene already in Acts 21, but it didn't occur to me then to ask what a tribune was. There were also military tribunes as mentioned in Acts 25:23. And although I'm not exactly sure what he meant, Paul says he's standing before Caesar's tribunal in Acts 25:10. So I don't know what everything means, but what I learned does give me a better understanding of what's going on in these chapters. I also learned that the barracks referenced in Acts 21-23 when connected to Lysias's cohort, refers to the Tower of Antonia, which was rebuilt by Herod. This tower was located on the northwest side of the temple in Jerusalem. Isn't it funny how often I can read something over and over again and never really know what it means? Sometimes it's just because I'm too lazy to put the effort into finding out. But I'm glad I'm taking the time this year to put in the effort.